Built with a modern approach to design and quality, Constance Lemuria appeals to guests who enjoy pure luxury in a preserved natural environment. In addition to elegant spacious suites and villas, swimming pools and fine food in a choice three restaurants, Constance Lemuria offers a stunning 18-hole Championship golf course. 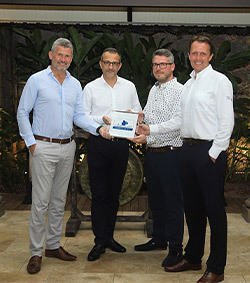 Constance Lemuria is the second hotel from the Constance group to connect with the network, joining sister venue Constance Belle Mare Plage, Mauritius. The venue for the 2019 MCB Tour Championship - Seychelles on the Staysure Tour, Constance Lemuria boasts the only 18-hole golf courses in the Seychelles with stunning views of the Indian Ocean. Iain McInally, Head of European Tour Properties, said: “Being able to welcome Constance Lemuria to our network is absolutely fantastic news for everybody involved. Bruno Le Gac, General Manager of Constance Lemuria, said: “Our team works hard every day and pays attention to all the small details on and off the course to deliver an outstanding golf experience to all our guests.